​Lightfast non-fading colours - Opaque - Non-Toxic. Professional ticketing and sign writing paint for all types of weather. 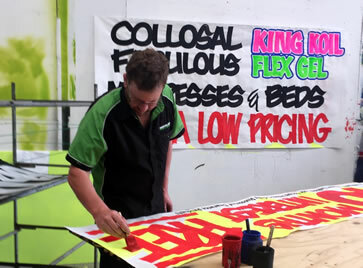 A vivid high performance matt painting colour for both indoor and outdoor professional sign writing, ticket writing, hobby and craft purposes. This water based paint is extra thick with strong colours made to last. It has excellent lightfastness with a quick drying time. Once dry the surface is wipe-proof and water-proof making it an ideal paint for commercial and general fine art applications. A palette range of strong bright inter-mixable colours is available including fluorescent colours and metallic gold and silver. UV Glow: When the fluorescent colours in this range are displayed under ultraviolet (black light) they come alive with an amazing magical glow. Stir the bottle before use. Thin with water if necessary and wash up utensils and brushes with soap and water immediately after use. Wear protective or old clothing. Some residual staining may occur. Surface preparation is important with any paint, undercoat with a sealer or FAS Gesso to improve durability for an all-weather non-fading finish. 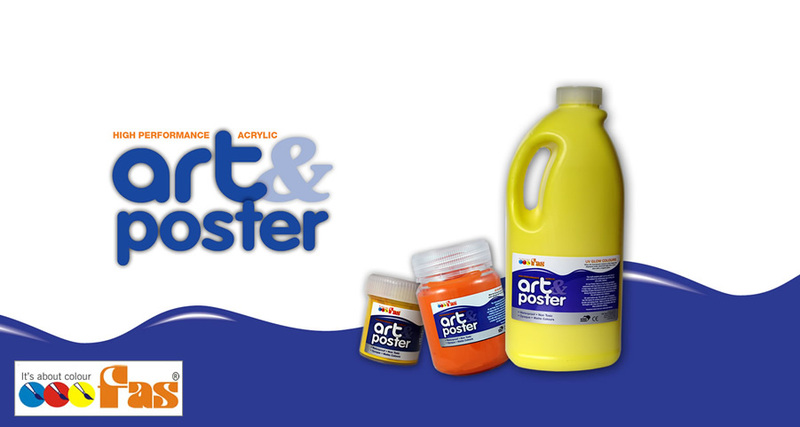 For best results with fluorescent colours, use Art and Poster White as a base undercoat. Ideal for use Ticket writing, sign writing, posters, large scale interior work such as theatrical scenery, large scale murals, classroom and studio work, general arts and crafts. The super-bright UV glow fluorescent colours are not recommended for intermixing, as this would destroy the brilliance of tone. 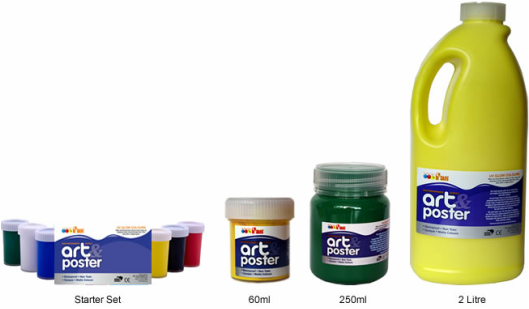 SINGLE COLOURS: 60ml, 250ml and 2 litre. Pumps available separately for 2 Litre. Black, Brilliant Red, Yellow, Green, Blue and White. Fl Red, FL Yellow, FL Green, FL Blue, FL Orange and FL Pink. ​This product does not contain dairy/casein, egg, gluten, soy or peanut products, by-products or derivatives. This product does not contain latex materials or animal derived ingredients.